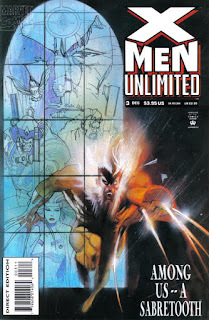 In the wake of Birdy's death, Sabretooth comes to Xavier for help quelling his homicidal rages. Maverick tracks down Sabretooth, who is growing increasing unhinged & slaughtering everyone involved in a deal gone bad, to a monastery in Barcelona, but Sabretooth manages to escape. Meanwhile, a man named Geinstach, who was also involved in the deal, meets with Commcast, hoping to hire him for protection. Instead, Commcast suggests Maverick or Wolverine. Maverick infiltrates the X-Mansion, hoping to get Wolverine's help, but Xavier offers the X-Men in light of Wolverine's absence. 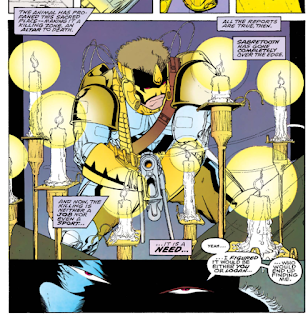 Meanwhile, Sabretooth meets with Commcast, looking for a telepath; he directs him to one affiliated with the Yashida clan in Japan, then contacts Maverick to give him a lead on Sabretooth. The X-Men split up, with Rogue, Gambit & Bishop going to Frankfurt to protect Geinstach, only to find him dead.. In Japan, Beast & Maverick are greeted by Silver Samurai, and they attempt to stop Sabretooth, but when he discovers the telepath has been incapacitated since the bombing of Hiroshima, Sabretooth runs off, and Beast knows where he is going: to Professor X. Later, Sabretooth sneaks into the school and finds Xavier in the library, but Xavier stops him with a telepathic blast, then enters his mind. Observing scenes from Sabretooth's childhood, he tells him Sabretooth has the ability to choose not to kill. Xavier will help him overcome his homicidal urges, but not by suppressing them the way Birdy once did. Sabretooth agrees, then later bemoans that he is essentially a prisoner. 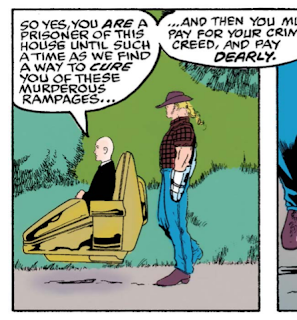 Xavier tells him it could be worse, but that he'll cure him, and then Sabretooth will pay for his crimes. Following up from the events of the Sabretooth limited series, this finds Sabretooth growing increasingly mad in the absence of the telepathic Birdy, as his animalistic side gets stronger without her periodic "glows" to quell it. 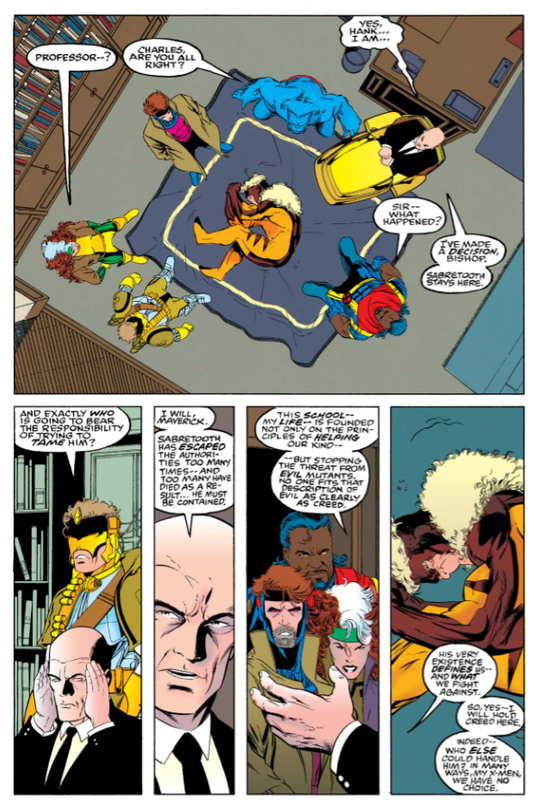 This ultimately leads him to track down Xavier, who agrees to house Sabretooth in the mansion in an effort to end his bloodlust once and for all, beginning a long period of time in which Sabretooth is effectively kept under house arrest by the X-Men (it will last until 1995 and roughly two years' worth of stories), after which he'll serve on X-Factor, so it'll be awhile before we have "regular" appearances by Sabretooth in which he's just a homicidal mutant with a particular grudge against Wolverine. 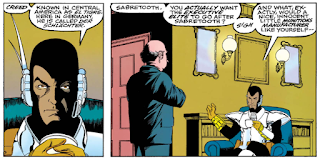 At the very end of this issue, we see Sabretooth talking with Xavier while wearing silver gloves; those gloves, along with a matching muzzle, will become part of Sabretooth's regular attire during the early days of his stay at the mansion, as they allow him to move about while keeping (theoretically) unable to kill (or at least, unable to use his claws and teeth to kill). 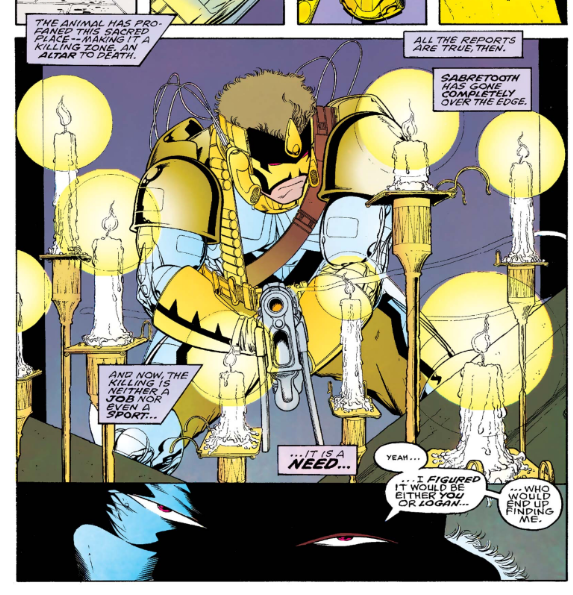 Maverick guest stars in this issue, standing in for Wolverine as the "character who has a past with Sabretooth and is willing to kill" amongst the other X-Men. CenturyLink Commcast, from the Deadpool miniseries, pops up briefly as well; this is his final appearance for a few years (he'll next pop up for an issue of Nicieza's Thunderbolts, and then in the 00's Cable & Deadpool series). 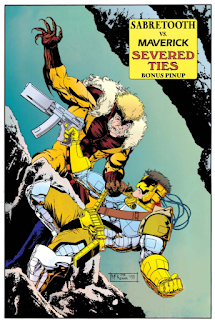 The issue closes with a pinup of Sabretooth and Maverick fighting. 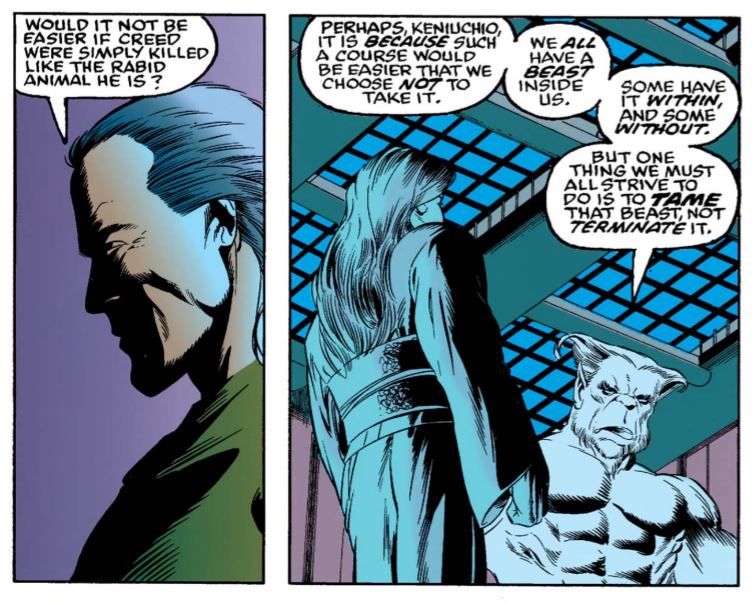 Throughout this issue, Nicieza uses the characters to espouse a "no killing" ideology, chiefly to setup, in part, Xavier's rationale to bring Sabretooth into the mansion. 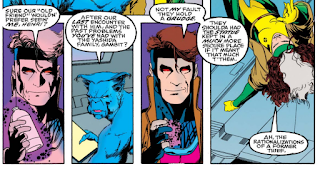 First, Rogue says that being part of the X-Men helped prevent Wolverine, Rogue, and Gambit (all villains and/or characters with looser morals before joining the team) from being worse. Later, Beast argues that everyone suffers from animalistic urges, and the goal should be to tame the beast, rather than kill it. It's an interesting thing to consider. When it comes to superhero comics, I am generally anti-heroes killing, both because I think superheroes should represent the best of us, and because, as Golden Age writers can attest, it's hard to come up with memorable villain after memorable villain when they keep getting killed immediately after being introduced (the best villains get that way via repetition and repeat appearances, developing history with their heroic foes; killing them off robs them of that ability). At the same time, as comics move further away from "zany schemes" and have villains committing more heinous real-world crimes (like indiscriminately killing people, as Sabretooth does here), it gets harder to argue with a hero not killing that villain, given the chance, and sparing future innocent deaths (this was, of course, the central thematic argument behind Spider-Man's multi-part "Maximum Carnage" storyline, the same year this issue was published). 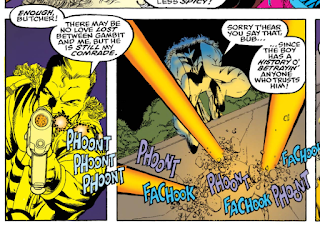 The events of this issue aren't nearly on the same scale as that (or, for example, all the people the Joker kills after escaping from Arkham for the umpteenth time), but at the same time, I did find myself considering the two Yashida guards who Sabretooth killed at the same time Beast was explaining to Maverick why they shouldn't kill Sabretooth. I mean, for all we know, they were just punching a clock, with families at home, and now they're dead because the X-Men want to tame Sabretooth instead of killing him, and that's all well and good, but it doesn't help those two guys (incidentally, my preferred solution to this kind of moral quandary isn't "have superheroes kill", it's "stop having so many villains obviously and casually killing so many people"; it's a lot easier to justify Batman not killing the Joker if the Joker only ever *tries* to kill a lot of people, but is always stopped by Batman985555555555). Former New Mutants penciler Bill Sienkiewicz provides the cover for this issue. Interior art comes from Mike McKone, some of his earliest work at Marvel (certainly, his first X-book). His big breakout will come in 2001 w/the reality-hopping Exiles, and he'll later work on the relaunched Teen Titans book with Geoff Johns, and spend a couple years drawing Fantastic Four. This story takes place after "Bloodties" (and Cable #6-8), with Xavier appearing here before Uncanny X-Men #308. It's noted that since the death of Mariko, Wolverine won't travel to Japan; we'll have to see if that holds up in his solo series (I suspect it doesn't). Maverick learns that Wolverine has left the X-Men. 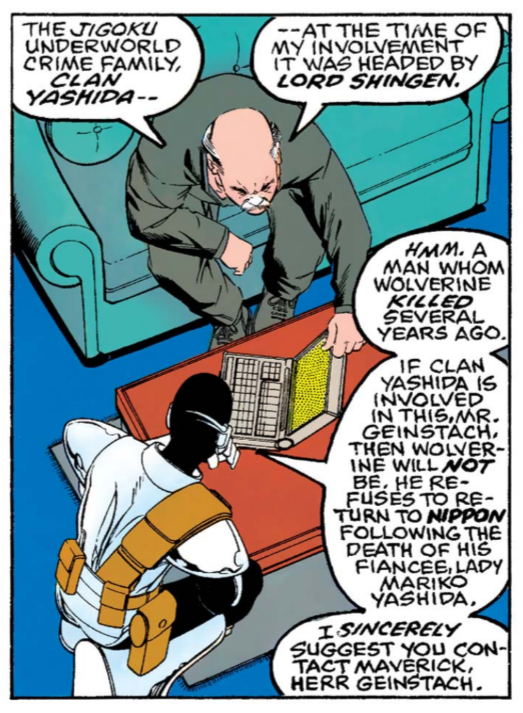 File "stole something from the Yashida family" amongst the other hints at Gambit's shady past. 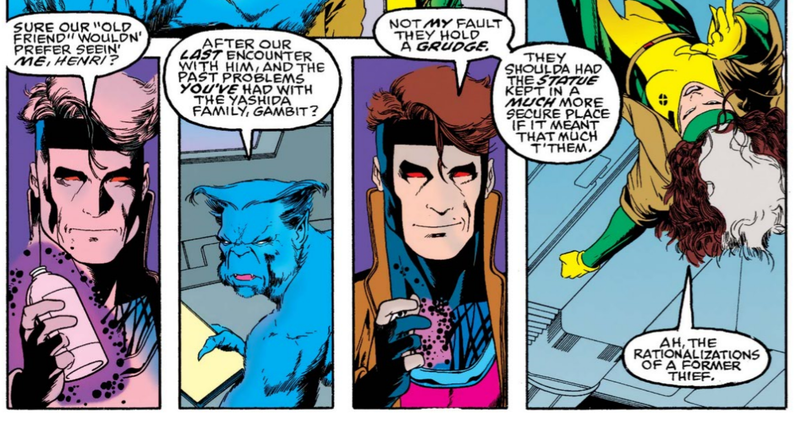 Sabretooth also says that Gambit has a history of betraying people, something that mostly holds up when we eventually learn more about their past together. For what it's worth, we see Maverick (from behind) without his helmet for the first time in this issue. When Professor X appears on the Astral Plane in Sabretooth's mind, he is wearing one of the school training uniforms. 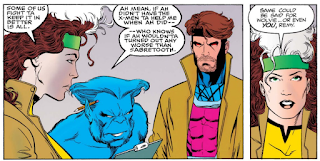 He notes that he recently spent some time where Sabretooth usually lives, and didn't like it, a reference to his extreme actions against Magneto in X-Men #25. Rogue says that one can always tell where the X-Men have been thanks to the destruction they leave in their wake. 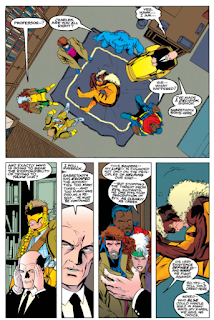 In terms of linewide narrative impact, no issue of this series thus far has been as significant as this one, as it introduces a new status quo that will stand for roughly the next two years, as Sabretooth becomes a fixture in the X-mansion and gets regularly pulled in to various plotlines. On the surface, this seems like a cheap way to get a Wolverine-esque character back into the fold while Wolverine is away dealing with not having adamantium, and while there's some truth to that, in execution, the plotline becomes much more than that (in part because it continues well after Wolverine returns, and in part because Sabretooth never really gets pressed into the Wolverine role, at least not for any extended period of time). While it arguably goes on a bit too long, the various X-writers across several different titles use the presence of Sabretooth in the mansion and Xavier's unilateral decision to keep him there to generate some interesting stories, up to and including playing a minor role in the development of Onslaught, amongst other things. As for this issue itself, it mostly works to bridge the gap between the Sabretooth mini and the new status quo. Sabretooth's madness (and desire to find a cure) is perhaps a little rushed and underdevloped (and I barely made an attempt to follow the overarching plot involving Sabretooth hunting down the players in a deal gone bad, which was mainly just a means to a very specific end), but Nicieza gets some decent mileage out of the "ethics of killing a foe" discussion, which also helps sell Xavier's decision at least in the context of this issue's story. McKone's art is a little incongruous, being brighter and more cartoon-y than the subject matter might call for, but the juxtaposition in tones between the script and the art helps underscore Sabretooth's inner conflict, and I appreciate the desire to do something other than the expected "moody and atmospheric" art for this kind of a story. Ultimately though, this issue is more significant in terms of the other, later stories it sets up, than for anything that unfolds in its pages (in other words, it's ending is its most important feature), but it nevertheless does a lot to help X-Men Unlimited feel like a necessary book where stuff happens, and not just a dumping ground for annual-style inventory and filler stories. Tomorrow, "Bloodties" continues in Avengers West Coast #101. Friday, Wolverine: Global Jeopardy. Next week, Uncanny X-Men #307. I loved this issue as a kid. It was the first (and for a few more years, only) issue of X-MEN UNLIMITED I read, and I'm not sure what prompted me to pick it up -- but I really, really liked it. I liked the idea of the X-Men fighting Sabretooth without Wolverine present, I liked the guest appearance by Silver Samurai, and I thought Maverick was really cool (I think this was my second exposure to him after the backup story from X-MEN 10 - 11). And I loved Mike McKone's artwork! I was way into the pseudo-Image style on the other books at this time, so McKone's stuff seems like it should've been less attractive to me, but for whatever reason, I thoguht it was terrific. I'm trying to remember now if I owned FROM THE ASHES yet... if I did, that could be what appealed to me about McKone -- to an undiscerning youngster, his work probably looked kind of Paul Smith-ish. That said, it bothered me then (and still bugs me a bit even now) the way McKone drew the points on Beast's hair droopy in every panel. Perhaps a "Work in Progress Note" (or maybe just a letterer's typo?) 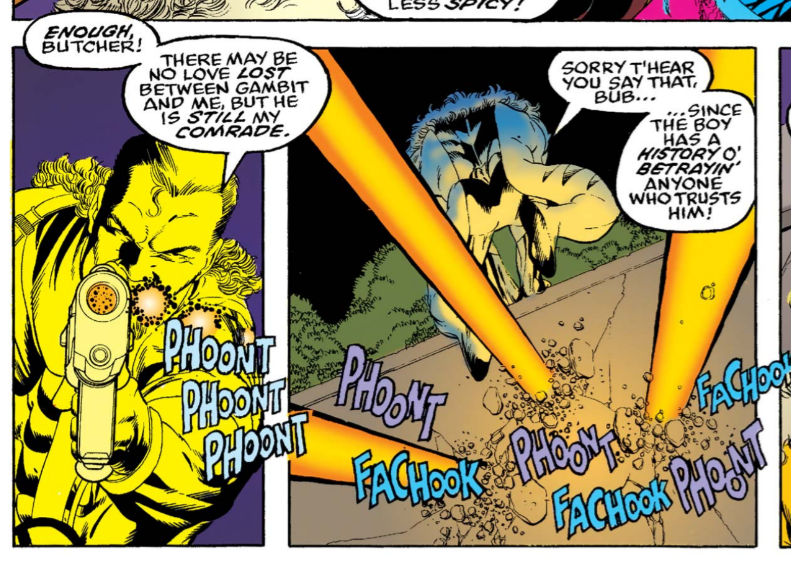 -- Sabretooth calls Gambit "LeBeaux" at one point, rather than the correct "LeBeau". Marvel reprinted this issue in their thick WEDDING OF CYCLOPS AND PHOENIX trade paperback. I don't know why, but the have X-MEN #27 preceding it in that collection. I wonder if there's something in that issue that says it needs to take place prior to this one in continuity? The issue after this one in the book is UNCANNY 308, which makes sense since all three issues are meant to be read after "Bloodties". "(incidentally, my preferred solution to this kind of moral quandary isn't "have superheroes kill", it's "stop having so many villains obviously and casually killing so many people"..."
THANK YOU! I agree with this statement one billion percent. Not all villains are mass murderers or even casual killers! It was a plot point in Kurt Busiek's THUNDERBOLTS that (after Baron Zemo left, at least) only one member of the team -- the Beetle -- had ever killed anybody (that we knew of, at least) -- and he had only ever killed one person! There's practically no way something like that could happen nowadays. This actually reminds me of one of my old superhero RPGs (though I can't remember which one -- I played a ton of MARVEL SUPER HEROES, but I don't think it was in that game) where, in the section on gamemastering, the book explicitly said that not all villains are killers -- and in fact suggested that most aren't -- with the reasoning being that while your typical bad guy doesn't mind facing jail time for robbery, very few want to risk a murder rap if they get caught. I thought that was pretty sensible, and I wish more comic writers would think about it that way. Teebore: "(incidentally, my preferred solution to this kind of moral quandary isn't "have superheroes kill", it's "stop having so many villains obviously and casually killing so many people"..."
Matt: THANK YOU! I agree with this statement one billion percent. Not all villains are mass murderers or even casual killers! It was a plot point in Kurt Busiek's THUNDERBOLTS that (after Baron Zemo left, at least) only one member of the team -- the Beetle -- had ever killed anybody (that we knew of, at least) -- and he had only ever killed one person! There's practically no way something like that could happen nowadays. re: supervillain ≠ killer, I agree with all this -- and remember Hawkeye's "Mach-1 must go!" 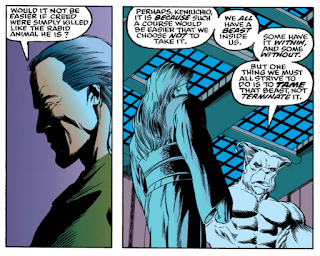 moment vividly (God, I loved that book) -- but Sabretooth is definitely a villain that always read to me as a killer. Everything that was introduced in this era with regard to Birdy and "the glow" felt wrong to me then and feels wrong to me now. I had the Sabretooth miniseries, but never read this issue. (I don't know why, but my old collection has no Unlimited issues -- except for #1, which I'm pretty sure I got LONG after its publication -- until the Rogue and Joseph story some years from now.) 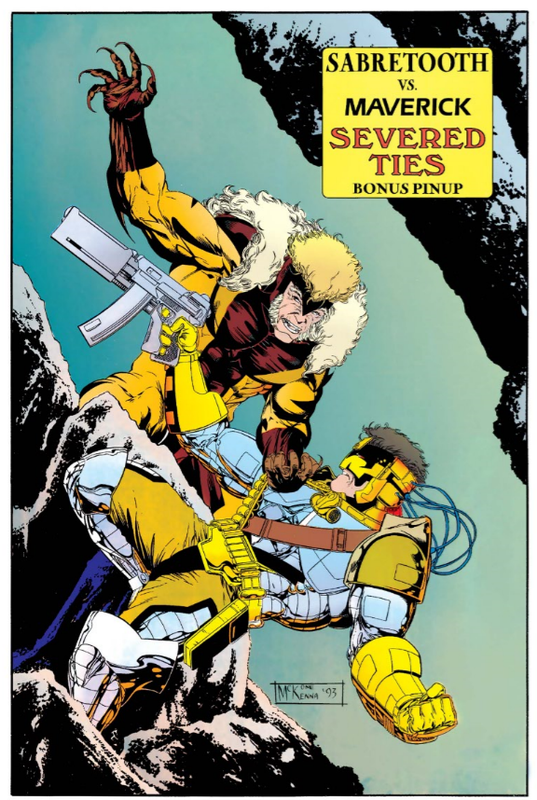 I only knew of its events from the narration boxes of various upcoming Uncanny and adjectiveless in which Sabretooth appears, and I recall the synopses of this story being so wrong to me that I thought I was missing something major. "SABRETOOTH sought out the X-MEN for HELP so he can overcome his killer instinct?! That's just crazy. I don't believe it." 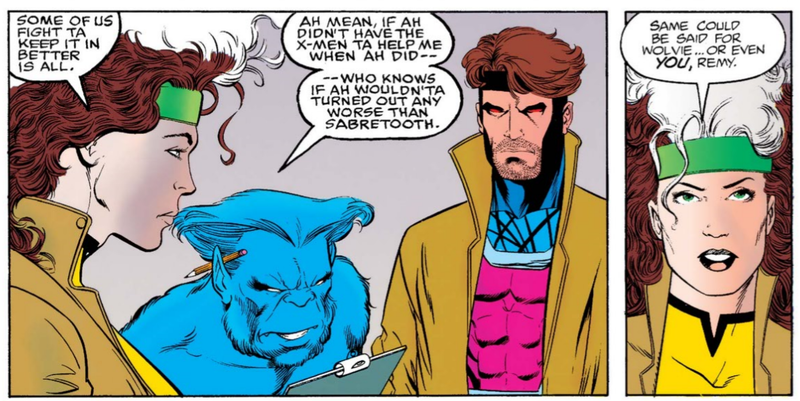 Thinking back on it now, Sabretooth being portrayed as a man who wanted to "get better" is probably the first time young Michael read a story and independently thought "This doesn't seem right to me" instead of just eating it up as the cool new X-thing. 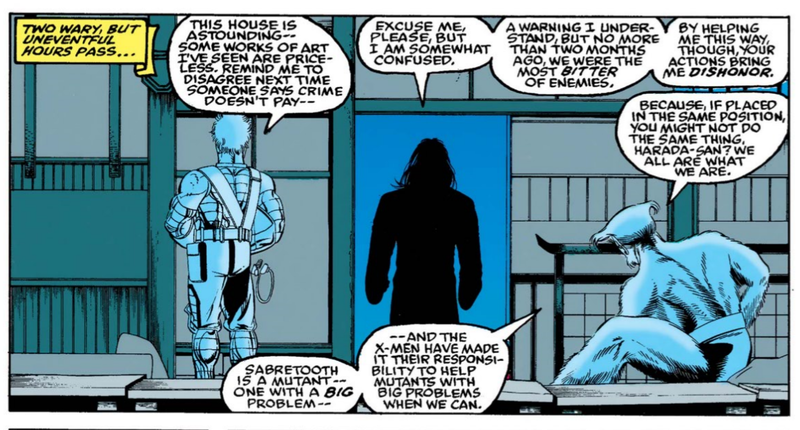 I can recall basically making up my own story in my head that the X-Men captured Sabretooth on some mission and it was Xavier's idea to rehabilitate him, not Sabretooth's, and that was "really" why he was at the mansion -- that's how wrong this whole Sabretooth arc felt to me. Re: Beetle- I think the implication was that he had killed a couple of other people but the Goulding incident (killing a guy after he had come up with the money he owed just to make a point) was the worst thing Abe ever did. 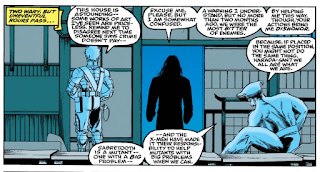 Oddly, it did not occur to me until much later that Sabretooth was being brought in to fill the Wolverine-sized hole in the X-Men; I assumed it was the current team trying to do their version of "Xavier Brings In Someone Of Dubious Morality Into The Mansion, Only Not Drawn This Time By Walt Simonson." For me, it was hard to invest in the choice to try to cure Creed because the very idea that he was something other than a killer was a handful of months old. 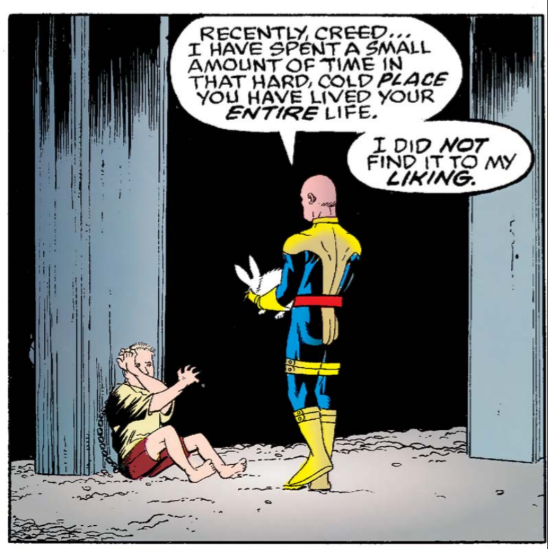 If you hadn't read the mini-series and knew that he apparently needed a telepath to moderate his moods or it would get bad, then this story just came out of the blue. Sabretooth was a bad guy who did Wolverine like things, but was a bad guy. There was no overarching need to try to make him better; he was something you stopped, not someone needing help. It felt forced then, and still feels it now, and I never really bought into it. To me, Sabretooth was nothing without his rivalry with Wolverine. Remove that, and he was frankly boring. I always thought the "contractors on the Death Star" argument was dumb- they knew what the Death Star was to be used for, they were just as guilty as everybody else. Yes, my point was that the contractors knowingly and willingly took the risk. Which applies to the bodyguards too. You dress up as ninja and sign up for gig at the Yashida mansion, any insurance company will exclude sudden adamantium poisoning in their policy terms for you. Of course they knew. It's called the Death Star. 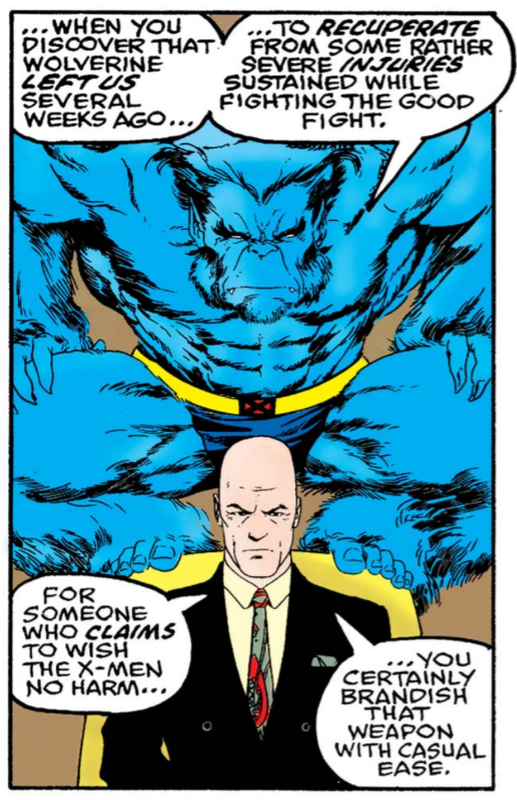 I found it odd for Sabretooth to advertise his specific need — maybe there’s a certain value in broadcasting that if he doesn’t get a telepath to help sort out his head he just might go completely berserk and kill everybody everywhere but that feels like my own attempt to No-Prize how free he’s being with his vulnerability. Is Beast rubbing his crotch on Xavier’s bald head in that panel in which he’s standing over his wheelchair? Beast certainly seems to be brandishing that weapon with casual ease. I loved this issue growing up. Creed going after all those men who paid him to clear their trafficking route was intruiging, as was his motive behind it. It also goes to show to what extent he'll go to satiate his bloodlust. He killed an entire family (including a kid). "It's noted that since the death of Mariko, Wolverine won't travel to Japan; we'll have to see if that holds up in his solo series (I suspect it doesn't)." I might be misremembering, but I seem to recall it being revealed to us in a later issue of WOLVERINE (or, perhaps, one of his many mini-series or one-shots) that he had gone to Japan to visit Mariko's grave, every year, on the anniversary of her death.